eBay have recently introduced an AI-guided shopping experience for similar-looking items on their Android and iOS apps in the US, UK, Australia and Germany. 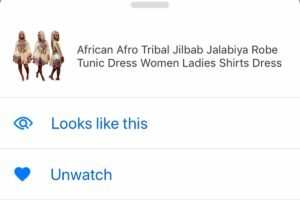 The new feature aims to find visually similar items shoppers might have in mind but not sure how to describe them to eBay. The new feature uses computer vision to find items that visually resemble shoppers’ search intent. Consumers can tap on the three-dotted menu next to a product, and it’ll give them two options to explore. First, a ‘looks like this’ option which allows shoppers to find visually similar items. Second, a ‘watch’ option to save an item for later . For instance, if a customer is looking for a dress they can use the feature to track down similar-looking items. Merchants will also benefit from the solution as out-of-stock items can be replaced with alternative options to mitigate the risk of abandoned baskets. I find this option particularly useful as I can track down items I took a picture of when I wasn’t sure about them or didn’t have time to purchase. The advantage is threefold. First, shoppers can find a product online that’s sold out in store. Second, find cheaper alternatives on eBay. Third, enjoy the convenience of getting an item delivered to home or office without having to make a trip to a store. I’m pleased with eBay for introducing this feature as it bridges the gap between uncertainty and purchase. For instance, I know that I want to buy an item I wasn’t sure about earlier if it keeps popping into my mind with regret not buying it originally. This means if I have made up my mind I can find and order the desired product with few clicks. To see how truly easy it is I tried out ‘looks like this’ feature without having to register on eBay. However, in order to ‘watch’ items, eBay asked me to log in or register so it could include this item to ‘watching’ section in ‘my eBay’ profile. This again gives a consumer an option to ‘like’ the item and have it saved in their profile so they could go back to it later or continue their shopping journey.